I have my review to share as well as a brilliant Q&A with the author himself! Why have a never read a Mark Tilbury book before now?? I stayed up late last night (23rd February) as I had to finish this book. I was desperate to find out what really happened. I know the words page-turner are used a lot in book reviews, but this really is one. When we meet Michael Tate he’s in hospital. He’s recently come out of a coma and is paralysed from the waist down. He had, allegedly, thrown himself off the top of the building he lived in after stabbing his girlfriend, Becky, 21 times. However, Michael has no memory of his crimes. He can’t remember anything at all. I wasn’t sure, at first, if I felt sorry for Michael or if he was faking his memory loss as others suspected. It was obvious that something wasn’t quite right about the whole thing. I also imagined Michael to be older than he was, until his age was mentioned. Detective Inspector John Carver is a sadistic character. He is determined to see Michael put away for this crime and his interrogation methods are despicable. He didn’t seem at all interested in finding out the truth, he just wanted the case closed and Michael behind bars. Michael has no defence and seemingly no choice but to lie there and await his fate. When strange things start happening to Michael during the night, I wasn’t sure if he was dreaming or hallucinating, but the scenes he is confronted with are heart-breaking. As the story unravelled, I became more and more shocked and sickened by what had happened in Michael’s past. Some people are pure evil and I think Michael might have wished he had never remembered anything of his past for the rest of his life, but he needed to know the truth. Was he really capable of murdering his own girlfriend? This book is brilliantly written. The characters are very real and believable. I did have to remind myself on several occasions that this is fiction as, to me, it reads almost like an autobiography, particularly as the story progresses. I really sympathised with Michael as I learned more about his horrendous childhood. (I loved the relationship he had with Liam and his dog, Oxo.) To think there are children out there in the real world who have been subjected to the abuse they suffered in their past is beyond devastating. The pace of the story is perfect, between learning about the past and working towards finding out the truth, I was totally hooked. It’s a very emotional read and one that made me feel physically sick at times. The descriptions of abuse are horrific and very upsetting, but the story is completely captivating and one I am unlikely to ever forget. Many thanks to the author for my ARC. First of all, thanks so much for inviting me. I grew up in Oxfordshire where all my books are set. I am widowed, and currently live with my girlfriend in a small village in the lovely county of Cumbria. I have two grown up daughters, and my eldest daughter has just given birth to my first grandson. I have always enjoyed writing, right back as far as I can remember. I just loved the magic of creating worlds where I was in complete control. The nearest thing to power a child can have! I spent some years in the Royal Navy, before getting married and having children. After being widowed, I didn’t write for ages. It was only with the emergence of Amazon Kindle that I thought, why not? With the help of my girlfriend, I started from scratch, learning about social media and all aspects of self-publishing. It was quite a daunting journey, considering I didn’t even know what Twitter was. A lot of people helped and encouraged me along the way, and I self-published my first two novels, The Revelation Room, and The Eyes of the Accused in 2015 and 2016. After receiving quite a lot of favourable comments about these two books, I decided to submit my third novel, The Abattoir of dreams, to a publisher. Luckily, Bloodhound Books believed in it, and it’s due to be published on 28th February 2017. They usually start with a character. And then, as strange as it may seem, the character speaks in my head. In the case of Edward Ebb in The Revelation Room, it was something along the lines of “Down the rabbit hole where all the burnt bunnies go.” Then it was up to me to try to make sense of it. Make sense of him, and who the “burnt bunnies” were. My new novel, The Abattoir of Dreams, started as a dream. I plotted it in one sitting the following morning. And then I changed it. And again. The finished story bears no relation whatsoever to the original dream, but the inspiration certainly came from it. Not specifically. Pastor Tom in The Revelation Room was influenced by attending a Pentecostal church when I was a kid. Although he bears no resemblance to the guys who ran it, the experience had a lasting effect on me. Good people with good intentions. I just have a comprehensive list of first names and surnames, and then try to decide which ones fit best. I do look for symbolism in a name if at all possible, particularly in the antagonist. I’ll begin by roughly plotting the whole thing. I don’t really care if the novel stays true to the plot, in fact, I like to be surprised by unexpected twists and turns, but I need the framework. I usually write out sixty scenes, separated into three parts. If I’m still happy, I begin. I try to write 2000 words a day, but sometimes that doesn’t happen. Once finished, I’ll leave it a while, maybe a month, then start the editing process. Then I’ll give it to several beta readers for feedback, make necessary changes, and begin editing again. All told, from start to finish, The Abattoir of Dreams took five months to complete, but that was extremely quick for me. Stephen King. Once I’d read Carrie, there was no looking back for me. I couldn’t get enough of his stories. They even started to become case studies from Misery onwards. There are a lot of books written about how to write, what to write, how to create, and although they may be extremely useful and valid, I think the best education you can get is from studying the works of a master. Dean Koontz runs King close as a writer, but the sheer breadth and volume of King’s output is, in my opinion, unparalleled. If you could meet any author, who would it be? And what would you ask them? I know it’s impossible now, but the one author I would have loved to have met was Catherine Cookson. She had such an interesting life, and I was always fascinated by her portrayal of life in the North East. I loved the historical nature of her books, and the gritty realism of her characters. I would ask her if there were any characters in her books that she wished she could be. Yes. I loved Enid Blyton, particularly the Famous Five. I used to devour the adventures of the four children and their dog, Timmy, then write my own stories. I can’t really remember too much about them, but I can guess they were probably in a very similar vein, and the plots were more than likely nothing short of plagiarism, but everyone has to start somewhere. Way back. It was something I always enjoyed. Pure escapism. My work in progress is called The Key to Death’s Door. It’s another thriller with a supernatural twist, but it’s radically different to The Abattoir of Dreams. I’ve written the first draft and edited it once. It’s now with my alpha reader, so still quite a long way from being finished. 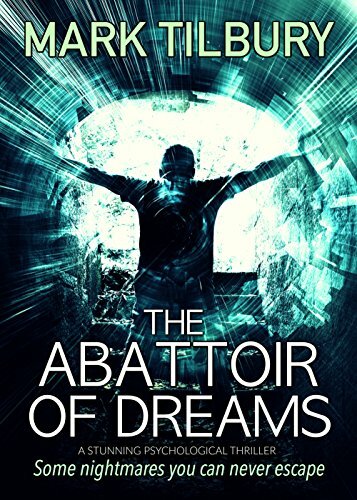 The Abattoir of Dreams was written in the first person, so switching back to the third person for The Key to Death’s Door was quite challenging, because I really enjoyed writing in the first person. My new novel, The Abattoir of Dreams is about to be published by Bloodhound Books on 28th February. It’s a bitter sweet story of murder, innocence and abuse. Michael Tate has not had an easy life. With his father in prison, and his mother dead, Michael was sent to Woodside Children’s Home. Now an adult, Michael wakes up from a coma in hospital suffering from amnesia and paralysis. Confused and terrified, he is charged with the fatal stabbing of his girlfriend, Becky. He also learns he attempted to end his own life. Detective Inspector John Carver is determined to send Michael to prison and to make him suffer. With no way of defending himself, Michael is left in his hospital bed awaiting transfer to remand. But then strange things begin to happen, and his childhood comes back to haunt him. Thanks so much for taking the time to answer my questions, Mark. Don’t forget to catch up with, and follow, the rest of the blog tour with these lovely book bloggers…..